Kuala Lumpur's primary shopping area is Bintang Hill, more commonly known as Bukit Bintang. Within just a few blocks are several shopping malls, catering to almost every need and budget. At the low end of the budget range is one of the oldest malls, Sungei Wang, full of small shops selling almost everything under the sun. Behind Sungei Wang is Low Yat Plaza, the place to go for cameras, computers and other electronic needs. The newest addition to the street is Pavilion KL, a massive shopping mall featuring a covered "restaurant street", gourmet supermarket and hundreds of shops and services. Move your mouse over the map icons to see more information. 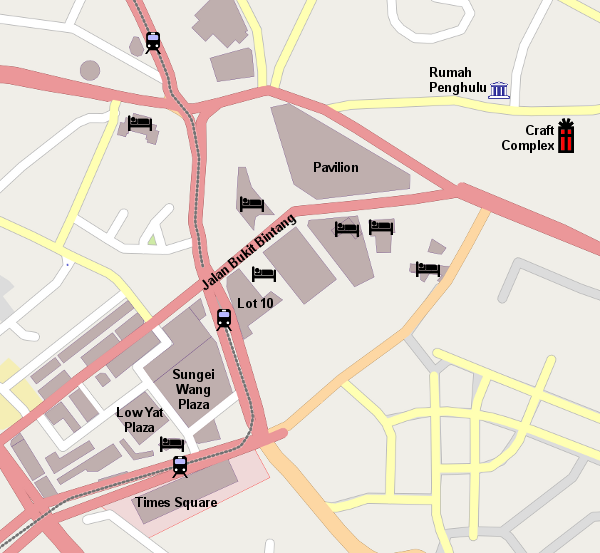 Click on the icons in the map for more information. The newest kid on the block, Pavilion is a massive shopping mall. It's covered "restaurant street" features several eateries in a sidewalk cafe atmosphere. More restaurants are downstairs, along with a gourmet supermarket. Meanwhile, the seven story atrium is lined with posh boutiques. Very up-market center at one end of Bintang Walk. The upper floors are almost entirely occupied by art galleries. On the concourse level, live chamber music floats up the huge atrium. Also on the concourse level is Shook!, one of Kuala Lumpur's most trendy eateries. The former KL Plaza underwent a complete renovation in 2009 and re-opened as "Fahrenheit 88" in late 2010. The interior and exterior were completely changed, and most of the tenants have changed as well. The mall now has a much more up-scale look and feel, and also has more food outlets now than it did before. When it opened in the 1990s, Lot 10 was the premier mall of the Bukit Bintang area, and really kicked off the popularity of the street as a shopping and entertainment district. But by late 2008 it had been eclipsed by several newcomers, and by early 2009 it seemed to be undergoing renovations to try and revive its fortunes. Sungei Wang's rabbit warren of small shops and boutiques is definitely the place for bargain shoppers. You'll find just about everything imaginable here, from mobile phones and digital cameras to fashions and beauty supplies. It's easy to get lost in this place, which also spills into a neighboring building called BB Plaza. There used to be a branch of Malaysia's own Parkson department store here, but as of early 2009 it was closed and being remodeled into more shops. The massive Times Square mall was something of a flop when it opened. It has somehow survived, and although the top floors are still pretty much unoccupied, you'll still find plenty of shops here to keep you occupied. Of particular note is a huge branch of Borders book store and an indoor amusement park.